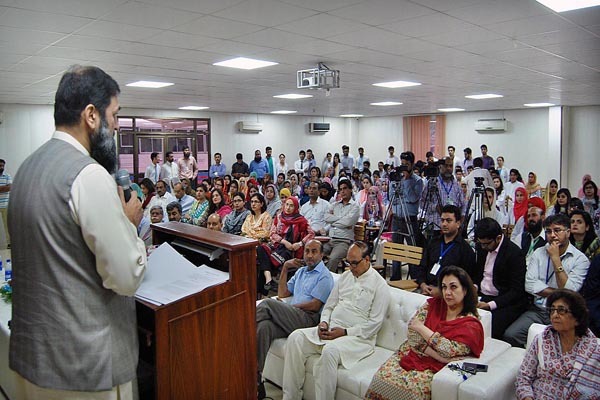 ISLAMABAD, May 8 (APP): Minister of State for Federal Education and Professional Training, Engr Muhammad Baligh ur Rehman Monday stressed the students to show sportsman spirit in their personal and professional lives. Speaking as a Chief Guest at the award distribution ceremony held at Shifa Tameer e Millat University, he also advised the students to accept their failure as a learning opportunity, an opportunity for improvement. The minister congratulated the students on their achievements and commended their noble medical profession. “Education is also about inculcating humanistic values in students; those students who care for others and have a passion of helping others become successful in their careers”, he said. “We need to develop the character to be happy for others’ successes; real winners are those who help others and doctors are best at doing that”, he added. He further told students that they must have a clear vision and destination in mind and approach their goals with consistency and perseverance. The minister further said that the teaching faculty should inculcate positivity in the student and counter negativity spreading sources in academic environment. Earlier, in his address Vice Chancellor, Shifa Tameer e Millat University, Dr Mohammad Iqbal Khan welcomed the minister and briefed him on University’s current programs, achievements and future plans. International Medical Graduates in all the categories of the International Competitiveness including “United States Medical Licensing Examination (USMLE)”, he said. He also informed the minister that the college has unique research laboratories with high tech equipment for the field of molecular biology, genetics and others. About future plans, he said that the University was in the process of launching three new faculties including the faculty of law, faculty of engineering while the current school of education would be upgraded to faculty of education. He said that the institution was also providing free healthcare services to around 500 poor patients on daily basis through Shifa Falahee Clinic at Shifa International Hospital. Minister appreciated the services rendered by the Shifa Tameer e Millat University and assured the Vice Chancellor of his support for all the good initiatives that the varsity undertakes.